คำอธิบาย: Multi-branch Manifold filter is particular design and produce for several samples filtrate at the same time. At present domestic laboratory filtrate liquid usually adopts the glass nature core, while this method only filtrate one sample once, and it has low speed, low efficiency, and less labor exertion. It is more convenience for the operator who needs to filtrate several samples at the same time. Because each filter holder have individual control valve, only one set vacuum pump can sustain the single or Multi-branch manifold filter operate together. 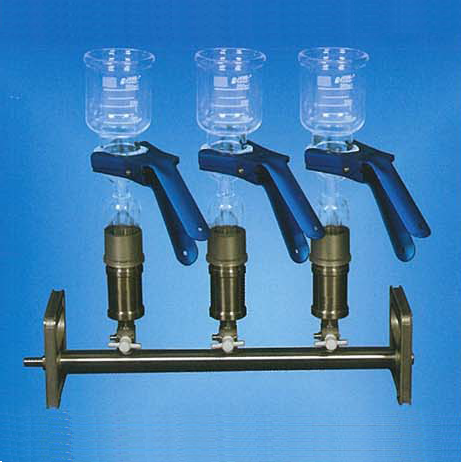 While stainless steel nature of the Multi-branch Manifold filter holder can filtrate at 180°C temperature ;and the high-quality extra hard glass is elegant in workmanship, and be able to bear up 200°C range of temperature.